Yuliya Ralko’s map, created in GEO241, uses data from the United States Environmental Protection Agency to show the locations of the 31 companies that released methanol (CH3OH) on-site in the Cook County in 2012. The highest amount (18,200 pounds) was released by Borgwarner Transmission Systems (Bellwood, IL); the smallest amount (10 pounds) by Regis Technologies Inc. (Morton Grove, IL). On the map, methanol release is shown using proportional symbols. The orange triangles show the locations of the firms in the relation to how much methanol was released. 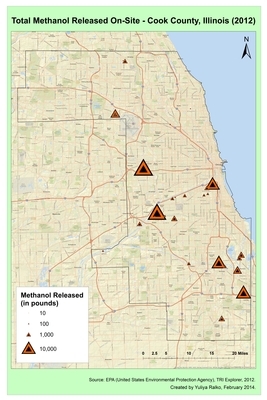 In the City of Chicago, the firms releasing methanol on-site are located south of Loop, close to connection of the I-90 and I-55 highways. It is important to understand the release of methanol because it is extremely toxic. As little as 2 tablespoons can be deadly to a child. About 2 to 8 ounces can be deadly for an adult. Methanol in smaller amounts can cause blindness by damaging the optic nerve. However, toxic effects take hours to start, and effective antidotes can often prevent permanent damage. Yet, despite these dangers, methanol is still released into the air and water in Cook County.